Targeting Cell Survival Pathways to Enhance Response to Chemotherapy encompasses recently developed molecular targeting agents and approaches that suppress cell survival signaling. Cell survival signaling attenuates the effectiveness of conventional chemotherapy and numerous mechanisms have been described, and continue to be described, which contribute to cell survival in the face of chemotherapy treatment. Key pathways leading to chemoresistance emanate from growth factor receptors, PI3K, STAT3, anti-apoptotic Bcl-2 family members, autophagy, and the DNA damage response pathway. New advances have underscored the potential of targeting each of these cell survival mechanisms to improve responsiveness to chemotherapy. 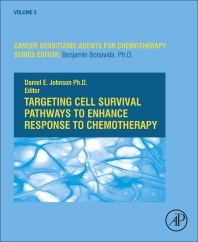 This book reviews these recent advances and provides a foundational background and hints of new opportunities for basic, translational, and clinical investigators focused on improving therapeutic responses to chemotherapy. Daniel E. Johnson received his undergraduate degrees in chemistry and mathematics from North Park University in Chicago, Illinois. He received his doctoral degree in molecular biology from Princeton University under the mentorship of Dr. Mark A. Bothwell. His postdoctoral research was done under the mentorship of Dr. Lewis T. Williams at the University of California at San Francisco (UCSF). He joined the faculty at the University of Pittsburgh and the University of Pittsburgh Cancer Institute in 1993, where he served as Professor of Medicine and Scientific Director of the Acute Leukemia Working Group. In 2016, he moved to UCSF where he is currently Professor in the Department of Otolaryngology – Head and Neck Surgery. Dr. Johnson has served as a standing member on National Institutes of Health and American Cancer Society study sections and has been a Section Editor for the journal Leukemia since 2001. His research is focused on anti-cancer drug development and the elucidation of cell death and cell survival signaling pathways in head and neck cancer and leukemia. He has additional interests in the development of chemopreventive agents and strategies. Dr. Johnson places particular emphasis on translating laboratory findings to the clinic and has collaborated extensively with physician scientists to initiate and conduct clinical trials in head and neck cancer and acute myeloid leukemia. .